In her latest commentary, CBS News Senior Political Editor Dotty Lynch looks at the early fallout from the Enron scandal. "After the contested election George W. Bush came in as Rutherford B. Hayes; eight months later he's suddenly Abraham Lincoln fighting for the safety and security of the Republic," said Professor Alan Lichtman on the CBS Early Show on Friday. As President Bush reaches his first anniversary in office, analysts are struggling with the two George Bush's. Is he the minority President, the frat boy from Saturday Night Live with the mangled syntax, the guy who leaves for the weekend early Friday afternoon or the world leader who delivered eloquent speeches to Congress and at the Washington National Cathedral in September, the guy with the megaphone in New York who climbed atop a fire truck assuring the rescue workers that the "whole world hears them" and the leader who still gets job approval ratings over 80 % at a time of prolonged war, domestic jitters and recession. Frank Bruni, the New York Times correspondent who covered Bush in the 2000 campaign and in the early days of his Presidency says the yin and yang of Bush analysis may be due to the superficiality of American politics and the need for oversimplification and groupthink in the media's coverage of political figures. In his forthcoming book "Ambling into History, the Unlikely Odyssey of George W. Bush" Bruni himself wrestles with the two faces of Bush. He chronicles the fun-loving, malaprope prone, somewhat lazy candidate who surprises with flashes of charm and literacy and spectacular political skills. He concludes that the secret to Bush's success post-September 11 in leading "a country that needed to be both rallied and consoled" may have been his ability to stay on course and detach from his worries. "And, perhaps his resistance to letting himself be consumed by his obligations also prevented him from being consumed by them", Bruni concludes in his epilogue. Whatever the reason George Bush begins his second year with sky high ratings from the public on the job he is doing (82% approve in the new CBS News poll) and specifically on his handling of the war. This approval extends to Democrats who give him a 66% approval rating and to 54% of African Americans. In addition, Bush has far exceeded expectations of how good a President people thought he would be. Last January 43% said they thought he would be good or very good, 42% thought he'd be just average. This year 71% say he's very good or good, 23 % average. Turning to domestic issues Bush's scores are not quite as high but the "afterglow" from his handling of the war—and the inclination which exists to rally 'round the leader in time of crisis may have boosted those numbers as well. However, the recession may be starting to take it's toll—especially with women voters. While the gender gap has diminished on other evaluations of the President, 29% of women say that the recession has a lot to do with Bush's policies and 41% of women believe he should have paid more attention to the economy during the war. At a forum in Washington in December Bush strategist Karl Rove laid out five issues which George Bush ran on and said they had a "seamless" game plan to govern on exactly the issues he campaigned on. This blueprint, of course, didn't factor in September 11 and focused heavily on a domestic agenda. The issues were: tax cuts, education, the solvency of Medicare and social security, enacting faith-based programs and military preparedness. Polls show that on education Bush and the Republicans have scored a solid win with voters now as likely to credit to the Republicans the as Democrats as the party which can best handle the issue. Education had been a "Democratic" issue. Democrats still prevail on Medicare and Social Security by 2-1. The tax cuts are popular although they are not a priority with voters who are more concerned about the recession and jobs. And a recent Pew Center poll said that the public liked the Democratic approach to tax cuts as much as the Republican one. Democrats are banking on voters to blame the looming deficits on Bush and are trying to link the Bush tax cuts (especially for the wealthy) to the poor economy and cuts in popular social programs. Bush's faith based agenda has suffered mightily from attacks form both left and right but his strategists think that being aligned with faith and values will serve him well even if specific policies don't get enacted. Military preparedness is being tested daily although long range policies have been put on the back burner for now. It was in the area of energy and the environment on which Bush had his worst scores pre-September 11 and that has only gotten worse with the focus on Enron. This week's CBS poll found that only 19% believe that the Bush administration is telling the whole truth about Enron and a majority believe Enron had a lot of influence in the creation of the Bush energy policy. By 60%-29% Americans believe that influencwas inappropriate. All and all it was a momentous first year. A year of great tragedy and testing. 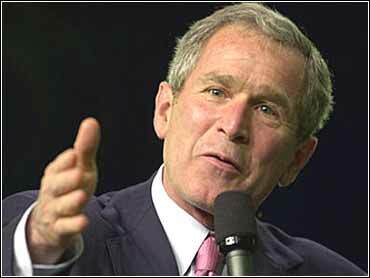 And, for now at least, George W. Bush has passed the biggest tests with flying colors. Now if he could only learn to lead and chew Pretzels at the same time. A veteran of the Washington scene, CBS News Senior Political Editor Dotty Lynch provides an inside look at the issues and personalities shaping the political dialogue in the nation's capital and around the country.